Or did Romney and Obama stop talking about immigration? Until DHS secretary Janet Napolitano’s press release on 15 June, for voters interested in immigration reform it felt as if they were reliving the summer of 2008 minus the excitement in late August when presidential hopeful John McCain picked Sarah Palin for his running mate. Friday 15 June is when Napolitano dropped the Dream Act bomb on what otherwise seemed to be just another endless ramp up to a the November elections. 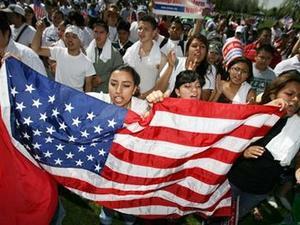 Just like all the other elections since the Immigration and Reform Act (IRCA) of 1986, a march towards the ballot box which promised nothing more than the soon-to-be rhetorical platform paragraphs on comprehensive immigration reform from both the Democratic and the Republican campaign camps. Then, from out of nowhere, the tricky Democrats drop a dream bomb that triggers a new immigration agenda widening the public discussion of immigration and immigration reform. Or does it? Four years ago presidential candidates John McCain and Barak Obama suddenly grew very quiet about both the need for national immigration reform and their respective agendas along with dates and specific details. With the national election only months away, behind closed doors a deal was struck behind by both parties, the same kind of deal that preceded the Congressional elections in 2006. The handshake between parties in 2008 was based upon a simple and successful slight of hand that had worked so well in 2006: both parties stopped serious discussion of replacing IRCA with substantive, pragmatic reforms addressing all the immigration problems confronting states at their doorsteps. Instead of comprehensive immigration policy, Obama and McCain in a similar vein invited a distant cousin from the southern border to the national election feast, a cousin called “operational control.” All other immigration issues, most of all the idea of comprehensive reform, were verboten until operational control of our southern border was achieved. Of course, the definition of operational control was always vague at best. In fact, operational control, a military term which time and again has been demonstrated to be dependent on the perspective of the beholder, has the kind of political legs that thrills the hearts of campaign consultants and warms the heart of every timid legislator regardless of party affiliation.